Gemini (the Twins), the most northerly constellation of the zodiac, appears here lying on its side. Classical Gemini contains the Summer Solstice, passed by the Sun on the first day of northern summer. The eclipic passes just north of Wasat. 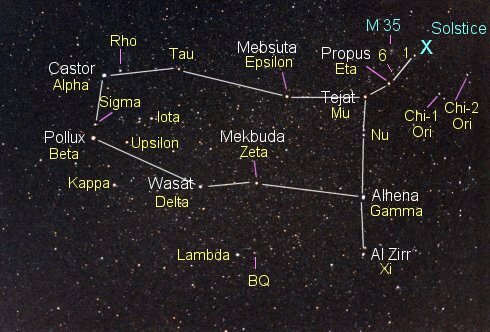 Mekbuda, Zeta Gem, is one of the sky's four bright Cepheid variable stars. M 35 is a classic open cluster. Gemini has three stars with orbiting planets: Pollux, HR 2877, and HD 50554.